Regal is an American movie theatre chain head-quartered in Knoxville, Tennessee. Today, Regal operates the largest and most geographically diverse theatre circuit in the United States with 7,334 screens in 588 locations in 44 states providing audiences of all ages with unforgettable experiences for an iconic American pastime: going to the movies. A clean, modern mark that elegantly captures the Ritz of the classic movie theatre. The multicolored backgrounds are huge part of the Regal brand. Playing off the look of multicolored spot lights, these backgrounds can by used to add vibrancy and color to a variety of applications while maintaining the clean minimal feel of the brand. The mark can be reversed out in white on these backgrounds to add that extra pop to the logo. Vital to any identity is a solid letterhead system. Complete with business cards, letterhead and envelopes, the Regal brand with be consistent and recognizable no matter where it is seen. The website, www.regal.com has all the info about everything Regal while maintaining the clean, bright look of the brand. Any customer can easily find any information they may need about Regal here. When the Regal site is accessed from any handheld device, the web app launches adjusting all the content of regal.com to be optimized for whatever device you are using to view it. The Regal Facebook page allows the company not only to communicate with customers, but also for the customers to interact with the brand on the web as well as share it among their social groups. The twitter page also features exclusive Regal news and deals for its followers and encourages interaction from customers. Packaging for food and drinks. What would a movie theatre be if it didn’t sell concessions? Everyone knows that half the reason people go to movies is to get the big bag of buttery popcorn to munch on during the movie. Regal has Hot dogs, Doughnuts, Nachos, Ice cream, Slushes, Drinks and many more delicious foods and beverages for you to enjoy along with your movie. 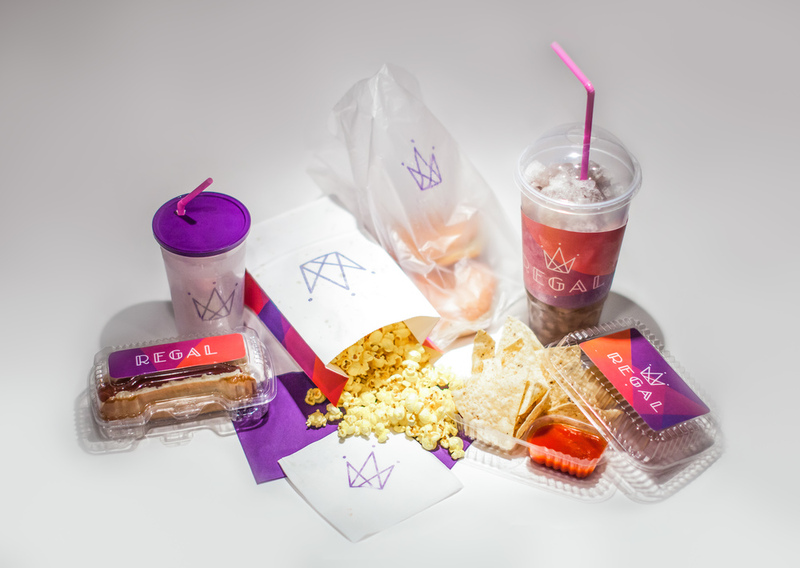 REGAL OFFERS ALL OF YOUR FAVORITE MOVIE SNACK FAVORITES IN ITS NEW COLORFUL PACKAGING BECAUSE AT REGAL, YOU NEVER HAVE TO WORRY ABOUT BEING HUNGRY! An integral part of every company’s environment and experience are it’s employees. At Regal not only should the employees be bright, friendly and inviting, but they should also look the part. Their uniforms are clean, yet colorful and fun, which when accompanied by a bright smile are bound to make any movie goers experience a positive one. AND OF COURSE WHAT WOULD A MOVIE THEATRE BE WITHOUT LUXURY CHAUFFEUR SERVICE AVAILABLE FOR All The RED CARPET DÉBUTS & SPECIAL EVENTS. AS ONE OF AMERICA’S FAVORITE PASTIMES, THE MOVIES SHOULD BE A BRIGHT, EXCITING ENVIRONMENT FILLED WITH LIFE AND COLOR, AND THAT IS EXACTLY WHAT REGAL STRIVES TO BE. IN THE WORDS OF THE LEGENDARY WILL SMITH, “THERE IS NOTHING MORE VALUABLE THAN HOW PEOPLE FEEL IN A MOVIE THEATRE,” AND WE COULDN’T AGREE MORE. LET’S MAKE THAT A GREAT FEELING. Regal fronts have always been bright and inviting. Neon signage lights up the dark inviting audiences in for what is bound to be an exciting experience at the local Regal.